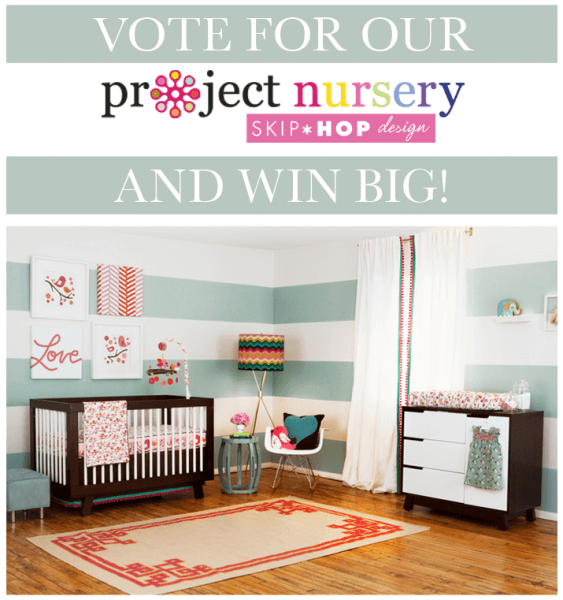 Vote for the Layla Grayce Nursery Design for a Chance to Win Big! As part of the Project Nursery Skip*Hop Nursery Design event announced a few days ago, Layla Grayce joined actress Tiffani Thiessen, Joy Cho of Oh Joy!, and Joni Lay of Lay Baby Lay in an exciting baby room design contest, where each participant was challenged to design a beautiful nursery on a budget! How can you help Layla Grayce win and possibly win some great prizes of your own? . . .
Vote for Layla Grayce as your favorite nursery design for a chance to win a Skip*Hop Springtime Birds Musical Crib Mobile and $100 Layla Grayce gift card! Three lucky winners will win this spectacular prize. Hurry, because this contest ends on July 10th! Vote Now!